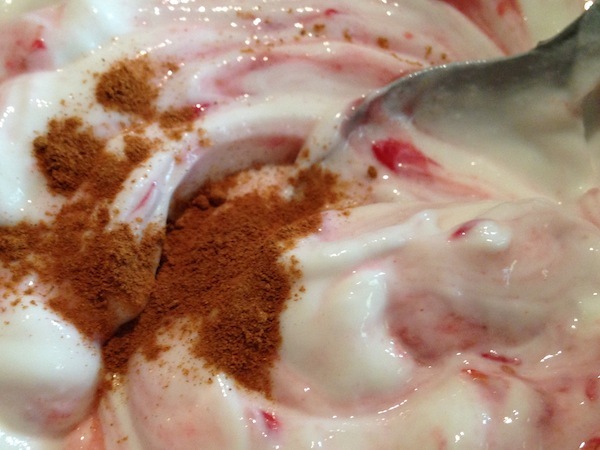 Homemade, High-Protein Ice Cream! | Keep It Up, David! Plus, it’s versatile. You can flavor it however you want. 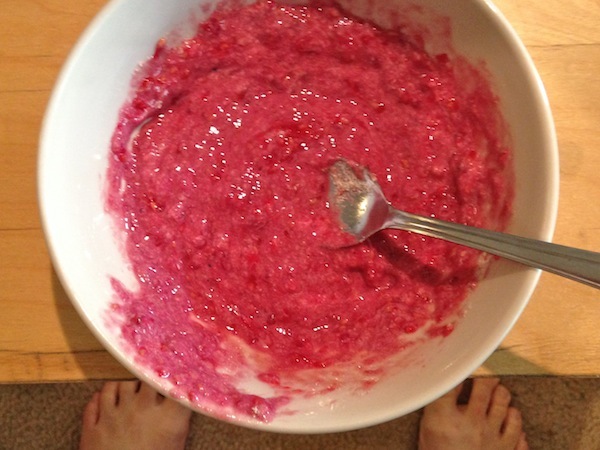 I used raspberries, but use what you have (or what you want to use up). 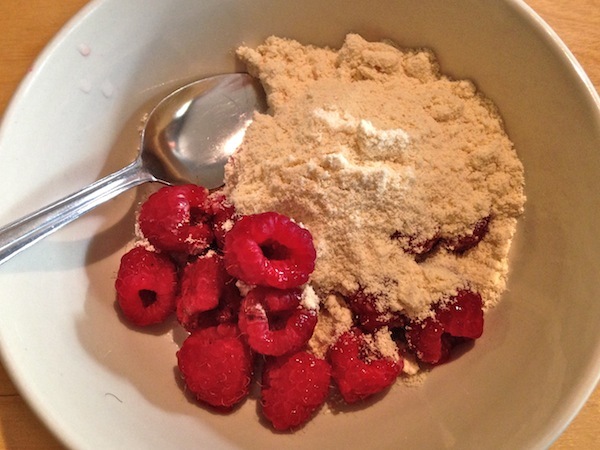 I started with 18-20 raspberries, which I put in a bowl with a scoop of vanilla protein powder. Then, using the back of my spoon, I smashed it all together until the powder dissolved. Then I added one 5.3-ounce container of non-fat plain Greek yogurt. I guess this makes it homemade, high-protein frozen yogurt, right? …and stirred it all up. Then, straight into the freezer. It’d probably be ready in an hour or two, depending on how firm or soft you like your ice cream. I ended up leaving the house for five hours, and it was the perfect snack when I got home at the end of the day. 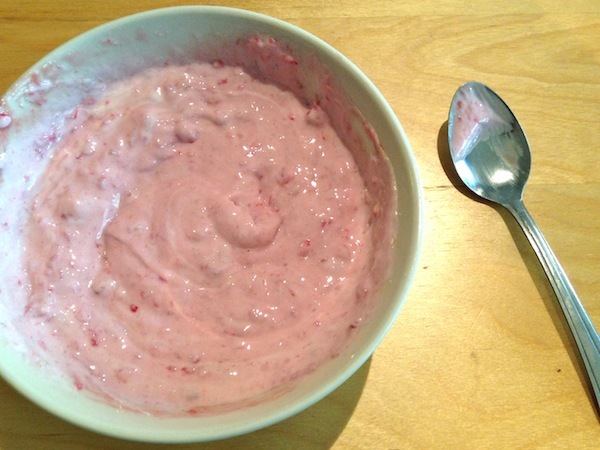 Even though the yogurt was plain, there was plenty of flavor from the raspberries and vanilla protein powder, and that powder is actually really sweet! 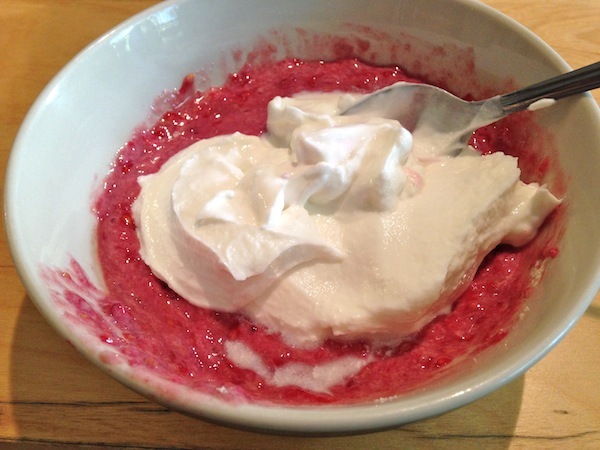 RELATED CONTENT: Lots More Recipes On My Recipe Page! I don’t think you’d eat this and get it confused with Ben & Jerry’s or Haagen-Dazs, but it’s a nice sweet treat that satisfies my ice cream cravings. 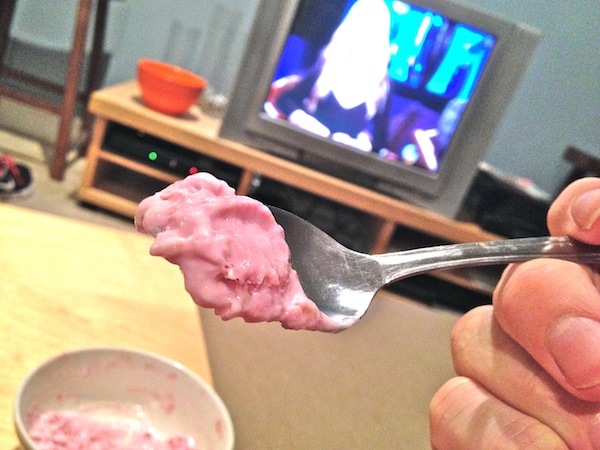 I ate this bowl while watching Shark Tank on my TiVo. Perfect for after a workout. Filling, too, and best of all, guilt-free! This entry was posted on Tuesday, February 17th, 2015 at 12:23 am and is filed under Uncategorized. You can follow any responses to this entry through the RSS 2.0 feed. You can leave a response, or trackback from your own site. 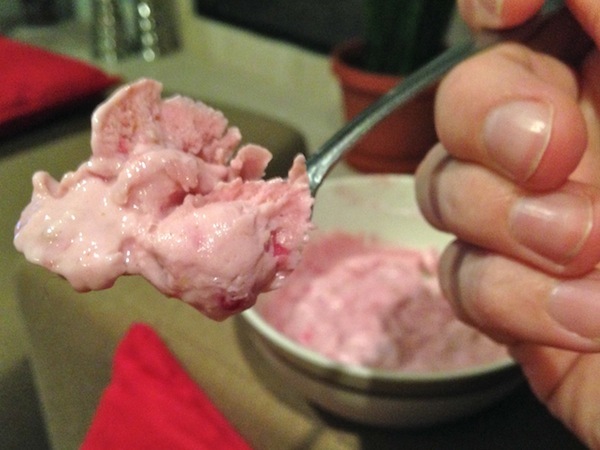 3 Responses to Homemade, High-Protein Ice Cream! I just got some Bowflex Body that I love, but the powder in the photo is called Amplify XL, and I picked it up at GNC. Trying to use it up before I dig into the Bowflex Body!